Effective learning supplys organizations with the abilities to cope with problems. Learning is occuring when organizations interact with their environments: organizations develop their understanding of reality by observing the results of their acts (cf. Hedberg 1981: 1). Even and especially bureaucratic organizations need to learn, when taking into account a fast changing environment.  Everybody of us has made his or her own experiences with bureaucracy in their everyday life. 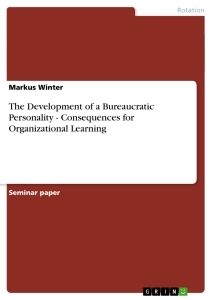 This seminar paper with the title “The Development of a bureaucratic personality-consequences for organizational learning” will not focus on impacts on clients but on impacts on the members of organisation, especially on subordinates and the middle management. The aim of the seminar paper is to find out what negative consequences has bureaucracy on the personality of an individual and on organizational learning. Using a functionalist approach to the topic, bureaucracy intends to create an efficient organisation from a rationalistic point of view. I will focus on the unintended outcomes of bureaucracy, the dysfunctions which show that there are irrational factors that are not easy to predict. I will describe in the theoretical part of this work the he ideal type of bureaucracy, to have a basis from which later on the negative outcomes are explained. The concept of personality will be described after this, which is used to compare in the second part the changes to a bureaucratic personality. The model of organizational learning from Hedberg (1981) will be the focus after that, to show how learning is occurring in organisations and which prerequisites are necessary for this. The next step is the explanation of the model of Bosetzky and Heinrich, which shows the consequences of inner acceptance of the bureaucratic socialization. Then I will show through the description of the work of Robert K. Merton the development of a bureaucratic personality, including trained incapacity occupational psychosis, and the consequences of that for organizational learning. Then I will finish with an conclusion. In this chapter will be the ideal type of bureaucracy and the characteristics of a bureaucrat described, to show later on the unintended consequences of this factors on people working in bureaucracies. In this chapter will be the ideal type of bureaucracy and the characteristics of a bureaucrat described, to show later on the unintended consequences of this factors on people working in bureaucracies. Max Weber (1864-1920) was publishing about the ideal type of Bureaucracy. He is one of the most influential german social scientists and one of the greatest minds ever (cf. Kaesler 2003:7). His bureaucracy model was a hypothetical rather than a factual description of the structure of organisations (cf. Robbins 1990: 309). Webers ideal type has a all pervasive element, that through rational rules tries to achieve a maximum of efficiency. The exercise of control on the basis of knowledge is the specific rational element (cf. Mouzelis 1971: 39). Each person`s activities distributed in a fixed way as official duties with specific spheres of competence. The duties are broken into simple, routine, and well defined tasks. Further bureaucracy is characterized by the hierarchical organization of offices, which means that each lower office is under the control and supervision of a higher one. This implies that every official's responsibilities and authority are part of a vertical hierarchy of authority, with respective rights of supervision and appeal. All Administrative acts, decisions, and rules are formulated and recorded in files. The Members of the administrative staff should be completely separated from ownership of the means of production or administration. The goal is to prevent them from interfering with the rational impersonal conduct of the organizational activities. Further the ideal type can be described by a complete absence of appropriation of his official position by the incumbent. Officials carry out their work as a primary occupation. So they don’t engage in secondary activities. They are employed by contract and receive regular fixed salary and pension according to their rank or seniority. The staff gets promoted by fixed career lines. Official are retained even if their skills become obsolete or they are not able to fulfill the job expectations. The administration staff follows formal rules and procedures to ensure uniformity and in this way regulate the behavior of the official. There is a continuous rule-bound conduct of official business and a specified sphere of competence (jurisdiction) (cf. Roth/Wittich 1978: 217-220). I. They are personally free and subject to authority only with respect to their impersonal official obligations. II. The staff is organized in a clearly defined hierarchy of offices, with a clearly defined sphere of competence. III. The candidates are selected on the basis of technical qualifications, which is tested or they show their ability through certificates, technical training or diplomas. So they are appointed and not elected. IV. Promotion is dependent on the decision of a superior official. V. The official is subject to strict and systematic discipline and control in the conduct of the office. VI. Administrative work is a full-time occupation, while work is rewarded by a regular salary and prospects of advancement in a lifetime career. The official is personally free to resign (cf. Roth/Wittich 1978: 220-221). Champion (1975) states that the best persons perform their jobs closely associated with their personal competence, every staff will have jurisdiction over a specified work area, eliminating double work and develop a strong career orientation which follows into a strong organisational commitment and loyality. Because of determined salary development, staff has more stability in personal planning and as a result reduced anxiety. The employee receives organisational protection even in retirement. The management can expect continuous quality work from their staff because of selection by test and their appointment to positions because of their proficiency. The officials can be easy replaced, because of selection by test and the system of abstract rules. As a result the organisation becomes maximum efficiently and effectively (cf. Champion 1975: 35-36). After looking on the ideal type of bureaucracy, my hypothesis is that bureaucratic rules have influence on structure of organisations, but also on the personality of its members. So I will first define the meaning of personality and discuss possible developments of personality in relation to different factors. “…personality [is] a more or less stable and enduring organization of a person's character, temperament, intellect, and physique, which determines his unique adjustment to the environment. Character denotes a person's more or less stable and enduring system of conative behavior (will); temperament his more or less stable and enduring system of affective behavior (emotion); intellect, his more or less stable and enduring system of cognitive behavior (intelligence” (Eysenck 1970:2). The definition implies that personality and its ]characteristics are more or less stable, but can be changed. Neyer and Lehnart underline when looking at personality the psychical charcteristics, like temperament, attitude, values, motives and aspects of the self concept. The most important definition are individual differences in segregations from other persons. The authors state that personality is quite stable and that organizations shaped more by personality than the other way around (cf. 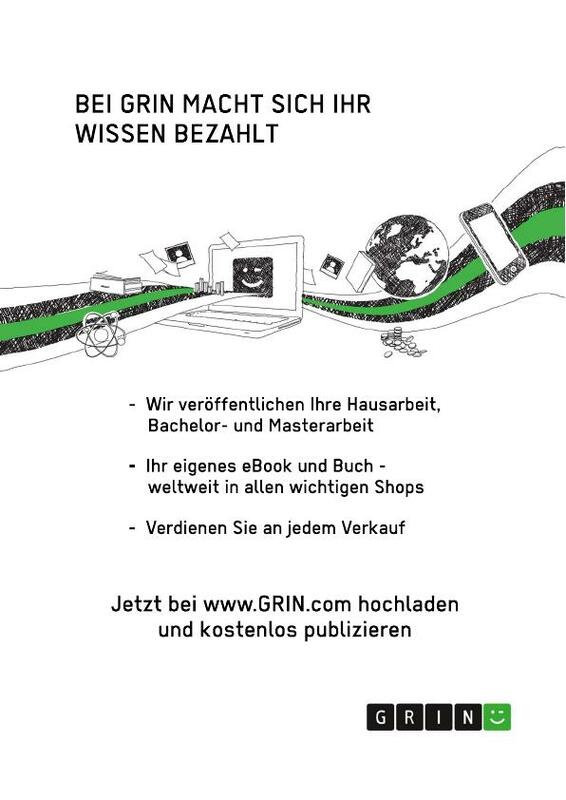 Neyer/Lehnart 2008: 82). With increasing age is personality less changeable, than in the younger ages of a person. Also the self-value of a person is increasing till the middle ages and deceasing in the last decades of the life around (cf. Neyer/Lehnart 2008: 85). 90 Personality is influenced by the environment and develops environmental specific features. Also the environment is influenced by personality specific features. There is a interconnection between them (cf. Neyer/Lehnart 2008: 90). There are several factors which can influence the personality of a person. The question is if the organization tries to socialice the ofical in a way by supporting and valuing the personality or identity, or is there a attempt to change the self-picture of the person (cf. Klatetzki 2008: 358). The Personality of a person is influenced by early experiences made in the past, in the family or in the culture. Dynamics like types or traits, gender, abilities, the physical condition, motivation, attitudes and perception play a role as well. Another factor is adult experience at work. This are achievements, roles and working experiences in the organisational context (cf. Mullins 2005: 340-341). The factor adult experience at work will be focused in this work, especially the socialization process which takes place in the organization. This chapter showed that there are multiple factors shaping personality and that different opinions exist, if personality and how much it can be transformed. A crucial factor for organizational learning is personality, which will not be focused right now, but in the following chapters I will show the consequences of the bureaucratic personality for organizational learning. The theoretical perspective on Hedberg (1981) is named as eclectic approach, to which the work of Peter Senge (1990) can be associated as well. Hedberg (1981) incorporates different theoretical elements into his approach. He conceptualizes organizations as cognitive systems that are developed by individual perceptions and interpretations (cf. Wiegand 1996:273-286). Hedberg is focusing on Organizational learning from a cognitive (cf. Pawlowsky 1994: 249) and functionalistic perspective (cf. Ortenblad 2002: 90). The learning process is concerning the organizational level (cf. Pawlowsky 1994: 308). I will focus only on parts of Hedbergs work, because the chosen aspects have to be relevant in relation to bureaucracy. The environment of organizations is changing frequently, that’s way it is important to unlearn obsolete knowledge. Organizational learning includes a defensive adjustment to the reality and offensive improvement of the fits between the environment and the organization. The cycle of organizational learning developed by March and Olsen (1976) is complemented by Hedberg (1981), building a SR Model. Hedberg admits that learning should be more than to respond or to imitate the behavior of others.